Benjamin's freshman Honors English teacher asked him to make a Wizard of Oz cake for her daughters surprise birthday party. Naturally he was so excited he said yes before we checked to see if there were any Wizard of Oz cake stuff out there. I spent the better part of the week searching for props for the cake and finally decided to make my own. Maybe it's Idaho, I don't know, but we couldn't find anything that would work. 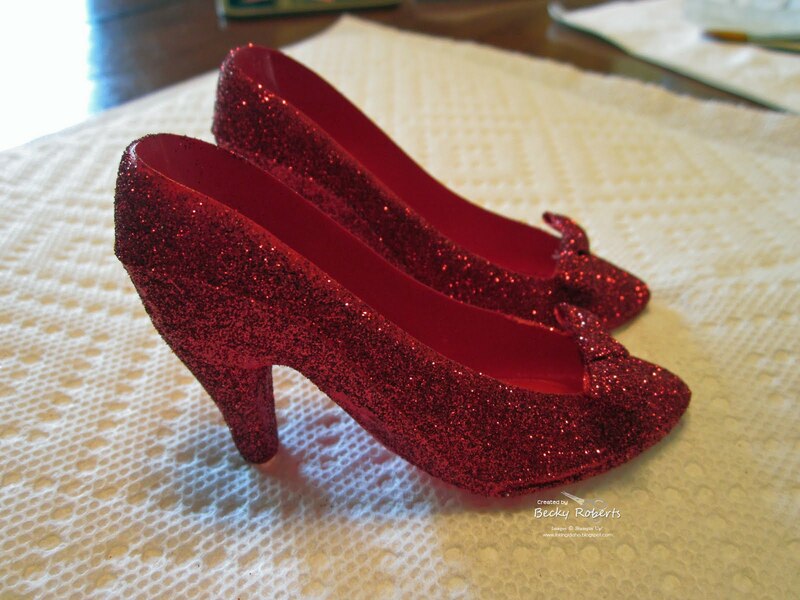 I found these clear plastic high heels that are actually wedding favors, that I was pretty sure would work for Dorothy's shoes. I bought red spray paint and gave them a couple coats. I tied SU! red grosgrain ribbon bows and glued them on. Then used Mod Podge and Stampin' Up! red glitter to bring them to life. Benjamin made the royal icing flowers and everything else for the cake. Took him about 6 hours to bake, cover with fondant and decorate it all. Kind of a weird angle, but here is the finished cake. Pretty darn good for 15 years old!! cake is fantastic! 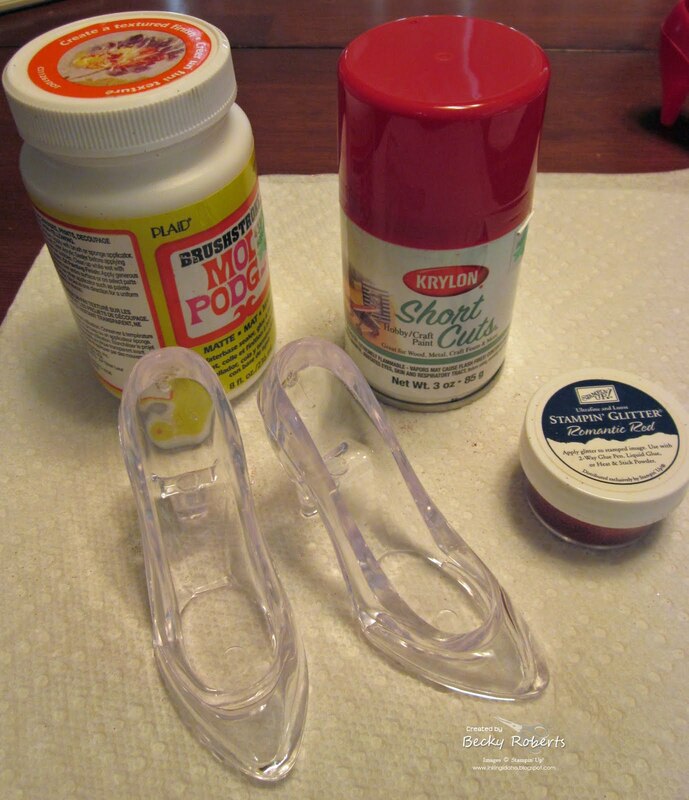 ...and I love your slipper solution! Wow! what a fabulous cake.... I love how you overcame the problem and created red glitter slippers fit for any Dorothy! Well done to Benjamin, a stunning looking cake, you should be very proud of yourselves! Your son is an amazing decorator of cakes, and only a freshman in high school. Awesome. Great solution with the shoes. Those shoes are genious! I love them. Becky, he sure does have the talent. Maybe he gets some of that creative geneous from his mom. Great cake! Have you started a scrapbook with all his cakes in them? Holy cow! Looks like that handsome son of yours inherited your creative genes! You deserve to brag a lot more than you do, girlfriend! :o) That cake is da bomb! Thanks for sharing! What a fabulous cake. If you could. pleaselet your son know that I think his creation is super fantastic! You must be so proud Becky! and that cake is awesome! This is amazing!!! He DEFINITELY has a future ahead of him!! I love the Wizard of Oz movie and the design of the cake with the little basket and "Toto" on the side is absolutely precious!!! Love it, Sweetie...keep up the good work and PLEASE continue to share, Mom!! OMGosh, this is amazing! He is so very talented & you both make a great team. Love the shoes, great idea! You can tell he loves making cakes. this is so great, I need Benjamin to come over and make me a cake.... and show me how to! lol. this looks so yummy. Love the glittered Dorothy Slippers. Pretty darn good?? I'd say that is "OVER THE TOP AMAZING!!" WOWZERS! 15 years old? I can't wait to see what comes down the road!!! It is amazing! I am sure it was a hit and made a little birthday girl very happy! This is awesome - I'm a Wizard of Oz lover and this cake would make anyone smile to receive it!! He's definitely a talented young man. Good work mom. If your Benjamin is this talented at 15 I can't wait to see what he will create when he gets older. majorly impressive! Good job Benjaminn! Wow! Ben that is awesome! You showed such detail. Absolutely PERFECT, stunning job!!! 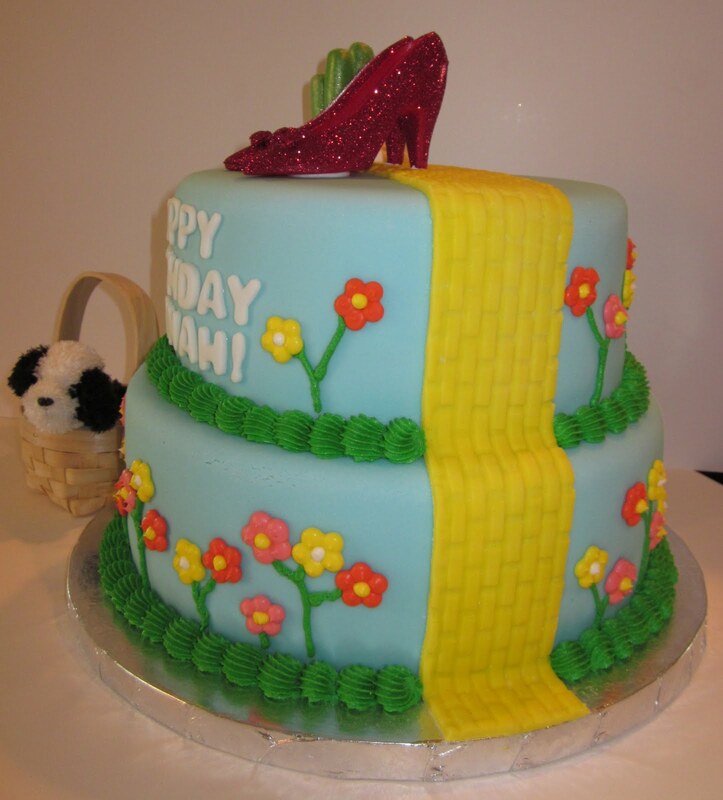 The glittered shoes rock, and I love having the City of Oz there on the cake too! Very well done! Becky, that cake is AMAZING, and Benjamin has such a gift! What a talented son you've got there! how awesome is that. talented mother and son!!! WOW! Very talented Son you have.He did a fantastic job. Ok, seriously Benjamin needs his own BAKING BLOG with BENJAMIN! OR a reality TV show! This kid's got TALENT! WOWOWOW is all I can say, the cake is absoultely BEAUTIFUL! He's got the fondant perfected! (That stuff is HARD to work with!!) I think I could have sent you my little MAX to put in the basket, who is a clone of ToTo, too! GREAT JOB BENJAMIN!!!! You've got the Roberts genes! Wow! what a cake. The shoe are great, but that cake! He is a pro. That is one very talented young man! I just love how the cake turned out. Great job Ben! Looks like you're ready to go on Cake Boss and help Buddy Vallastro on TV! He needs to have his own show! Wow, amazing for a 15 year old. Big things are coming his way! He has talent! I am totally impressed by your son's incredible talent. I am sure the birthday girl is going to LOVE her cake. Benjamin -- YOU ROCK! What terrific creativity! Enjoy your Proud Mom moment, Becky! Benjamin will be a TV star before you know it. How proud you must be! You worked together and came up with a PERFECT cake. Great job! Becky - your son's talent is amazing! Please tell him how much I admire the cake. I know it was a hit at the party. Thanks for sharing him and the cake. That is pretty darn good for a 40 yr old too! I love the slippers and his cake is awesome! You got a really talented guy there. Maybe the Next Great Baker or Cake Boss! You have outdone yourself. You need to open a business since there aren't a lot of bakeries in Boise or Nampa. Have you done your first wedding cake yet? 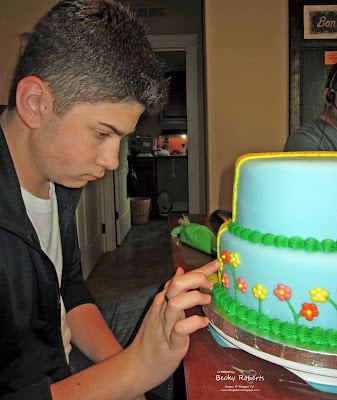 I have watched Amazing Cakes on HGTV and they have mentioned that fondant is very hard to work with. You parents are going to need to build you your own shop. Congratulations on a job well done! What a gift. That cake is fabulous. Those ruby slippers ROCK! Love everything about this cake! I'm glad there is no brocl on this cake. That's amazing, you son is so talented and the shoes are perfect! Wow, I am quite impressed by your son's skill. He is amazing and it looks like he inherited his mom's creative genius. This is good for "everyone" This cake is really stunning!!! I am not one to leave comments on posts but when I saw your slippers and than the amazing work, I felt compelled too. They both are wonderful pieces of art/work! Thank you for having the time to share. Benjamin is the NEW CAKE BOSS!!! Love it! Those shoes are amazing! It's almost too cute to eat! the cake is amazing and all the detail he put on the cake...the shoes are perfect. He is really a professional, I see a career in his future...Cake Boss watch out!! WOW!!! What a Cake!!! Fantastic Job -- both of you. The talent in your family is astonishing!!!!! Wish I lived in Idaho!!!!!! You both did a fabulous job, Congratulations to Benjamin on a beautiful decorating masterpiece!! what an amazing cake... he truly is one creative boy. I expect to see him on the food channel very soon.. Just amazing. Hey, there's an idea for a reality show on the food channel, teen chefs!!! Such a talented son! 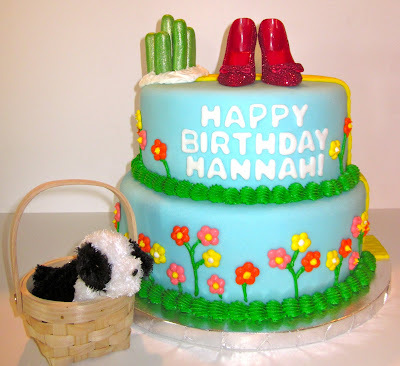 I love the Wizard of Oz and this cake represents it well! I see the apple doesn't fall far from the tree! He's going to be a Pastry Chef? What a fantastic looking cake. I love the shoes, too! Talent runs in the family! Wow this is awesome, he did a great job! You should be oh so proud! That is amazing. I had a customer at class this weekend that makes cakes and she was talking about instead of fondunt she uses marshmallows and icing sugar, she says it takes yummy. Leaving another comment cause I like this word verification better. Dang that's excellent can I borrow him LOL. You have an extremely talented young man. Love his cake! Thanks for sharing!!! That is an amazing cake!! Cute shoes...but what a great job done by your son! You should be proud!! Benjamin has talent for a 15yr old boy! Well done. Your cake is so stunning. I LOVE it. WOW!!! HE HAS UNBELIEVEABLE TALENT!!! Wow Benjamin is a very talented 'young' man, his future looks very successful. You better stalk your front door cos a knock from Buddy or Duff is only moments away I reckon. I love your red shoes, awesome job Becky! This is an amazing cake! Such a commitment fpr a 15 year old! When will the Baking Idaho (one cake at a time) blog start up?? Your son is a very talented cake designer. 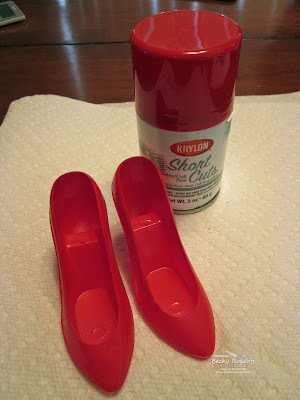 The idea for the ruby shoes is fantastic. Wow, what a fantastic cake!! I decorate cakes and he can definitely compete with me! He should be competing in challenges and competitions if there are any in your area, he's a natural! Oh Wow, waht a fantastic cake! And the Slipper a fabulous!I like it!!! WOW that is more than pretty darn good that is AWESOME! What a talented little man you have there. I am a cake decorator and he is wonderful. I love his cake. Tell him if he is ever in Louisville, Kentucky I would like to meet him. I think he is very talented. I think your son has discovered what he needs to be when he grows up! That is amazing!! You should be more than proud!!! Outstanding!!!! And actually really outstanding since he is so young! It looks like he has found a passion that he is good at and enjoys! OMG!! That is great. I just finished all 3 of the classes and all I can say is more power to him for using fondant. Have your son check out this blog: sweetapolita. She did an awesome cake with fondant asparagus, and she has some really good looking recipes for cake and icing (I haven't tried any yet, though!) His cake is awesome! Love the basket weave on the yellow brick road! What a beautiful cake! Congrats to your son. WOW!!! That cake is FABULOUS!!! As a baker, and decorator of cakes, I know how much work and sweat goes into pulling off a cake like that! GREAT job on every last detail! Your son is obviously VERY talented Becky. P.S. Loved the shoes - they turned out fantastic, just the touch that this one of a kind cake needed. Awesome cake! Luv the slippers too! WOW!! The apple doesn't fall far from the tree, eh?? Creative talent certainly runs in the family. This is an absolutely show-stopping cake!! Becky OMGosh that cake is fantastic the two of you are sooooooo AMAZING! 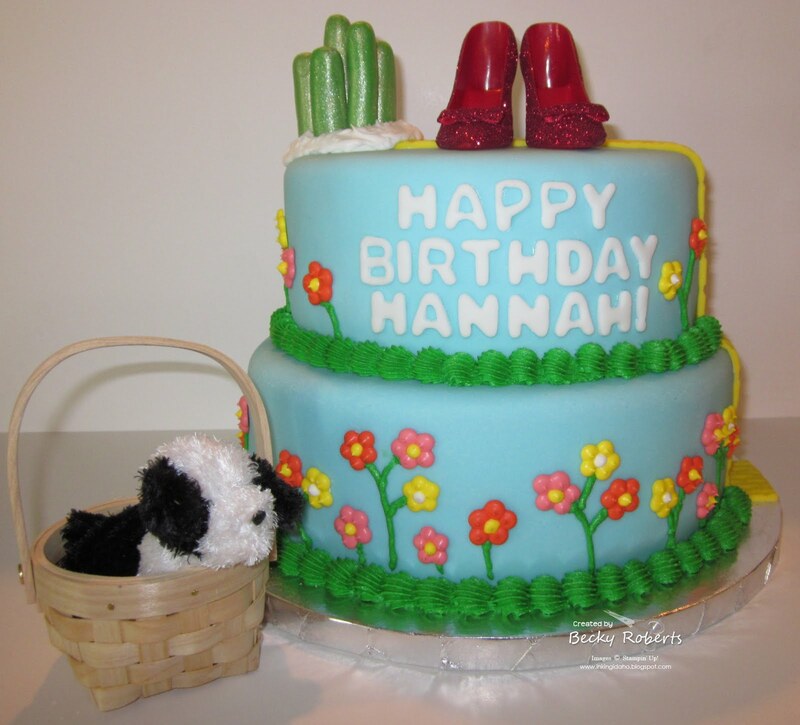 I never would have come up with that idea with the slippers I probably would have copied a picture out of a colorin book colored it in and added it to the cake....you have so many awesome ideas in your head. I thank GOD everyday for SU and meeting so many talented people!!!! The cake is fantastic, your son should be very proud of himself, I know you must be. I would love to receive it, its beautiful! What a amazing Cake. Very talented. Love the Slippers! What an awesome cake and slippers. You should both be proud..what a baker. what an awesome cake and what a great idea. Benjamin Rocks!!! They say like father like son, but in this case like mother, like son. You both are artistically gifted!!! What a hugely talented young man! Great cake, Benjamin! WOW...that is talent and awesome to see a 15 year old with such a passion. Those shoes were so smart and the cake deisgn is just so much like Duff! WOW!!! That says it all. nice work ben! and you too! i saw wizard of oz sb papers! Wow! I can't believe a 15 yr old made that fabulous cake!!! Good job! And love the shoes!!! Your son is amazing!! You must be sooooo proud!! Love the slippers too!! That cake is amazing. You have a very talented son.